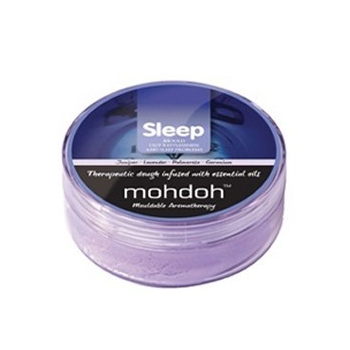 Home › Mohdoh Sleep Mouldable Aromatherapy - for Restlessness, Insomnia or Sleep Problems. Mohdoh Sleep Mouldable Aromatherapy - Mohdoh is an aid for helping with everyday ailments from insomnia, travel sickness, worry and anxiety to colds and flu, lack of focus, hyperactivity, headaches and tension. It is available in breathe, calm, headeez, sleep, think, travel and unwind. The synergistic effects of touch and smell help to treat a number of stress related complaints and the squidgy, putty like, tactile nature of the dough has in itself a soothing, calming effect. Sleep is a powerful natural remedy that combines the proven elements; aromatherapy and colour therapy to create an extremely effective yet kind way of dealing with restlessness, insomnia or childhood sleep problems. How it works! As the Sleep dough is warmed the carefully selected essential oils are vaporised and inhaled providing fast and effective relief from restlessness and insomnia. At the same time the specially selected colour of Sleep helps to relax tired minds and promote gentle natural sleep. These unique, therapeutic elements combine to form a powerful, holistic therapy that really works. Sleep is 100% non-toxic, fully complies with EN71 safety legislation and uses only the purest natural essential oils. Mohdoh MUST be kept in the air tight container provided at all times when not in use and stored in a cool, dark place. The dough will dry and the aroma of the oils will fade after approximately three months - More frequent use will reduce life of product. Partially dried dough can be refreshed by warming in microwave for a few seconds ONLY. Those who are pregnant or suffer from epilepsy should seek medical advice before using. Email a Friend Mohdoh Sleep Mouldable Aromatherapy - for Restlessness, Insomnia or Sleep Problems. Bookmark Mohdoh Sleep Mouldable Aromatherapy - for Restlessness, Insomnia or Sleep Problems.